Seiler arrives and quickly inspires love in two women: Alfhild and Thelma, the fiancée of the insane and deformed Count Albano. But all is not what it seems. Behind his polished and handsome exterior, Seiler is cold and calculating, and it soon becomes clear that he has come to Hammarby for reasons other than to build the church. His real aim is vengeance, and the fulfilment of a generations-old curse! 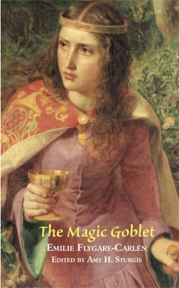 Controversial in the 19th century for its depiction of the callous anti-hero Seiler and its honest treatment of the subject of divorce, The Magic Goblet was nonetheless one of Emilie Flygare-Carlén's most popular works. Once widely read and highly regarded both in her native Sweden and in the English-speaking world, Flygare-Carlén has long since fallen into obscurity. Recently her work has received new attention from scholars in Sweden, and this Valancourt Books edition gives English-speaking readers the opportunity to rediscover this important and fascinating writer.